Had the plants for over 3 months now and they still look great. Blue Ridge Blueberry Bush are edible plants to grow in your yard. Our commercial fruit plants are shipped fast too. At our online store, you can find these plants year round. These berries are high to use in jams, jellies, and cobblers. Blue Ridge Blueberry Bush bare root is an excellent addition to any home. Berry plants are great to have around your house. Their berries are high to make jams and pies. Berry plants can provide you with delicious fruit. You will always have good fruit with this plant. This is a beautiful plant to add to locations on a lawn. Blue Ridge Blueberry Bush plant is a quick growing plant and can grow two to three feet each year. These plants provide gorgeous color and beauty as they bloom and produce little flowers in the spring as the berries begin to develop on this shrub. The seeds from this plant can be used in a wide selection of recipes and are also great to eat and enjoy right from the bush as they are harvested. Several of these shrubs can be planted together and is a beautiful way to make sure that the fruit is fresh and right off of the vine when consumes. These berries are fantastic when used to create delicious jams and jellies. 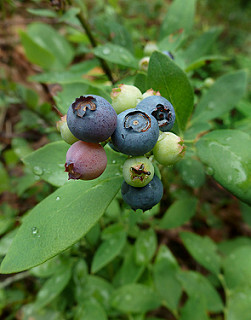 Vaccinium Pallidum of the heath family is commonly referred to as hillside blueberry, Blue Ridge Blueberry, late lowbush blueberry, and fresh lowbush blueberry. It is inherent to Canada and the central and eastern United States, specifically the Ozark Mountains of Missouri, Arkansas, Kansas, and Oklahoma. The Blue Ridge Blueberry is a deciduous, flowering shrub.